Being a New York Locavore means not only eating locally but drinking locally too. Which means spending ample time sipping local wines. New York has three major wine regions–the North Fork of Long Island, the Finger Lakes and the Hudson Valley. We get out to the North Fork a few times a year. A quick day trip, courtesy of Zipcar or a leisurely train ride and we’re there. And the Hudson Valley is practically a stone’s throw from our parents’ homes, so getting out there isn’t a problem. That only leaves the Finger Lakes. There’s no easy way to get there besides renting a car and driving the 5.5 hour trek. To make it worth it we stay at least three nights, meaning a long weekend, meaning using an extremely coveted vacation day. We take our time off very seriously and if it comes down to spending an extra day in Ireland or a weekend in the Finger Lakes, Ireland wins hands down. So, the moral of the story is, we don’t get up to the Finger Lakes too often. Though when we finally make the trek earlier this month for the first time in 4 years it made me wonder what kept us away for so long. If you only visit one winery, Damiani Wine Cellars is it! Compare a North Fork wine to a Finger Lakes wine you’ll have two completely different experiences. Just as if you were to compare a Californian and Italian wine. Superior winemaking skills help but a lot has to do with the growing region. The North Fork of Long Island has dry hot summers, making it the perfect climate for hot red wines. I’m not a Merlot fan, yet every trip I somehow come back with half a dozen bottles. Where as the Finger Lakes has a climate all of its own. Nestled in the hills and valleys of upstate New York, the Finger Lakes exist in a cocoon, free from harsh storms, similar to the weather of Germany and Austria. Therefore grapes such as Riesling and Gewurztraminer do exceedingly well. The three main lakes of the Finger Lakes–Seneca, Cayuga and Keuka–have at least 45 wineries, on their trails. Count the smaller, off the beaten path locations and you’re looking at nearly 100 wineries. The disadvantage of the Finger Lakes vs. North Fork is distance. Pull out of a winery in the North Fork and you’re already at your next winery. Whereas the wineries scattered around the Finger Lakes can be miles apart. 100 wineries scattered around 3 lakes (at least a 20 minute trip between lakes)–you’d need a month to even attempt to visit them all! Luckily you have me. Keuka Lakes Vineyard’s backsplash, created by hand. 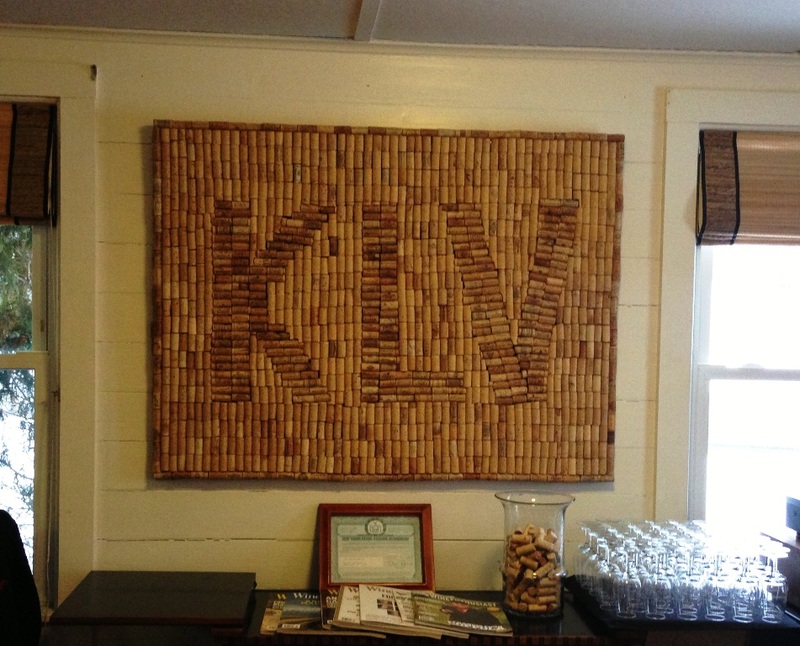 The artist is now working on a full map of Keuka Lake needing over 100,000 corks! I’ve narrowed down my some of my favorite stops on each lake. And because I’m an equal opportunity alcohol appreciator, I’ve thrown in a little beer and cider too. If you’re going for an extended visit I have PLENTY of other suggestions, but below are my favorite MUST VISIT locals places. 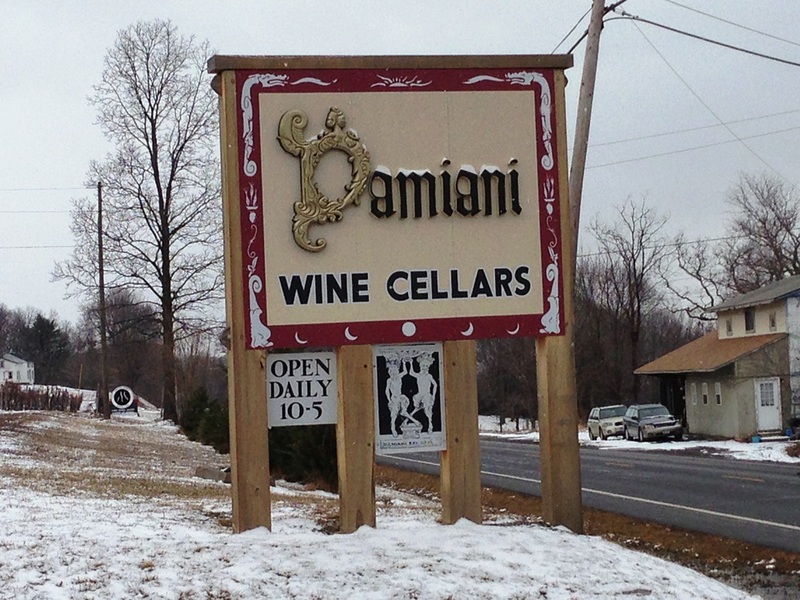 DAMIANI WINE CELLARS – We discovered Damiani on our first trip to the Finger Lakes in 2008. After a few disappointing stops with sweet and sweeter reds, we were excited to find some real reds. Damiani focuses on quality over quantity so be assured anything you sip will be outstanding. It’s a smaller winery, not on the official Seneca Wine Trail, translating to no buses, fewer crowds and quality time with knowledgeable staff. I love their Cabernet Franc Reserve, but then again, I love all Cab Francs. Without that bias I’m not sure I could pick a favorite. Reds over whites by a slight margin and be careful not to try the reserve wines unless you plan on buying them (too good to pass on). HERMANN J. WIEMER VINEYARD – One of the oldest wineries in the Finger Lakes and regarded as one of the pioneers of viticulture. 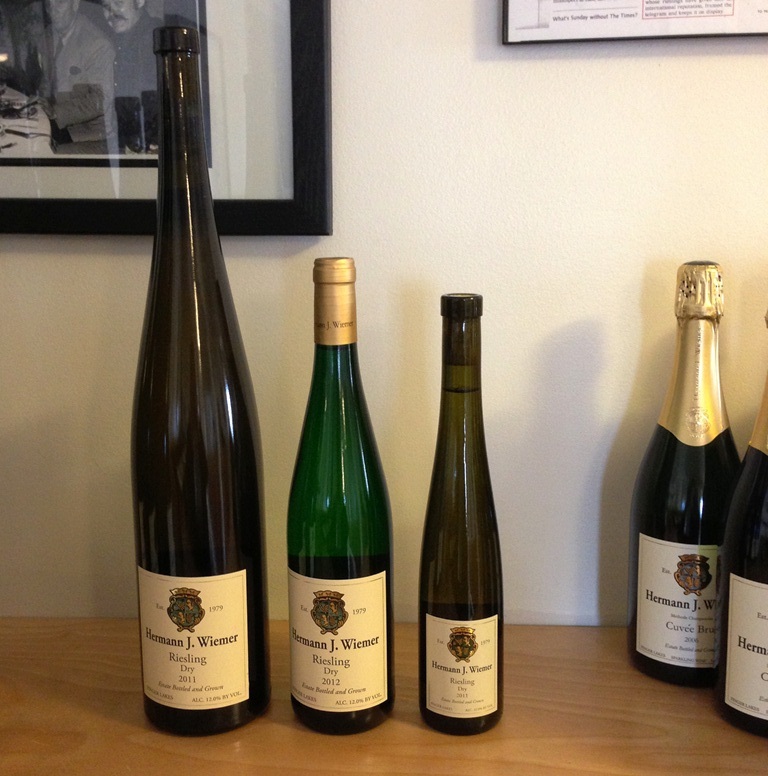 Hermann J. Wiemer also put New York wine on the map with their outstanding Rieslings. At first, I was expecting just that, a collection of perfectly executed Rieslings, but oh, they had so much more to offer. Try the Rose Cuvee, a blend of Pinot Noir, Cabernet Franc and touch of Chardonnay with dry berry notes. Or the Pinot Noir rich with black cherry notes and soft oak tannins. ANTHONY ROAD WINE COMPANY – Anthony Road got some huge press this year when Tierce, a collaborative Riesling by Anthony Road, Fox Run and Red Newt Cellars, was served at the Inaugural Luncheon. But even before their day of fame, I was already on board. Back in 2008 we bought a rose wine, one of the first I’d tasted (and enjoyed) in New York State. It actually gave me the courage to explore rose wines, now finding them essential to some meals and occasions. Sadly, that rose is only produced in perfect growing conditions, one that hasn’t happened since. Anthony Road’s wines always surprise me, elevating flavors in varietals I might normally shun, like their Pinot Gris. And of course, having a few furry friends to visit with in the tasting room is always an extra bonus for me. KEUKA SPRING VINEYARDS – This was one of the few wineries we visited that didn’t charge a tasting fee. Not that tasting fees were a lot in the Finger Lakes. $2-3 for a flight vs. the North Fork $8+ seemed like a bargain. But not charging for a tasting gave me extra confidence in Keuka Spring’s wines. It was like saying, we know you’re going to love and buy our wines. What’s a few bucks for tasting between friends? Keuka Spring’s wines provided the best bang for our buck, with a comfortable price point around $15. These are every day wines yet have the ability to make the simplest meal special. I preferred white over red at Keuka Spring, but with nearly 2 dozen varietals and blends, you’re bound to fall in love with (at least) one. 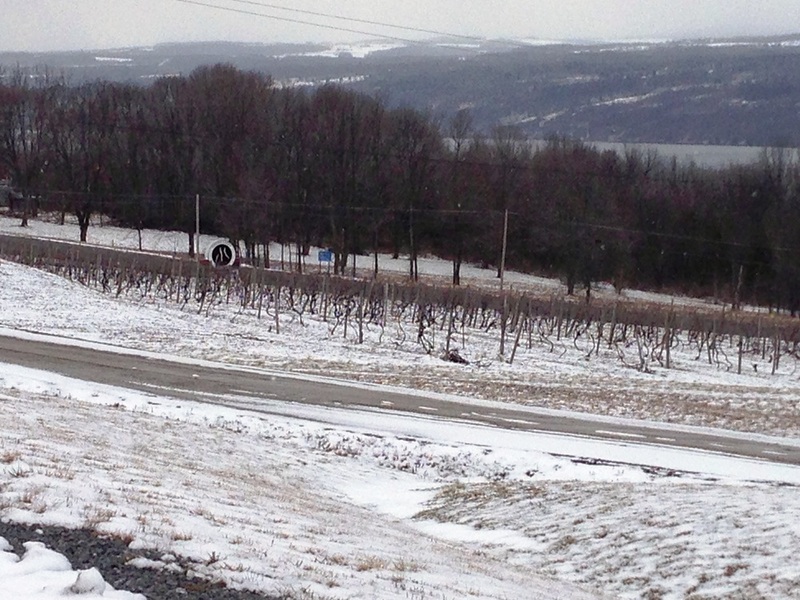 KEUKA LAKE VINEYARDS –Keuka Lake is another smaller winery, not part of its lake winery trail. Walking into their tasting room, I could immediately see why. There was another small group, already tasting when we walked in; 8 people already seemed like a crowd. I panicked for the staff a little when I though of the crowds peak season must bring. Unlike many of the other wineries in the Finger Lakes, Keuka Lake had a short list of just 9 wines. Yet it was obvious that a smaller collection meant more attention to detail in what they did produce. Their 2011 Gently Dry Vignoles brought me forward to a warm summer afternoon, sitting on our rustic and bloomy patio the front stoop of our apartment building. It was just what I needed to escape the 20 degree weather and soft snowflakes teasing me from the tasting room window. MCGREGOR VINEYARDS – There’s always some kind of event going on at McGregor, whether it’s a release party, barrel tasting or food focused gathering. Their communal tasting room offers plenty of opportunities to chat with other wine enthusiasts. Rather than hovering around a long bar, McGregor has slab tables scattered in various nooks of their tasting room. Sit where you like, take a peek at their extensive wine collection and a member of their knowledgeable staff will assist you. McGregor’s claim to fame is their Black Russian Red. This deep purple, almost black elegant wine is an intense blend of Saperavi & Sereksiya Charni grapes with complex berry flavors and smooth tannins. It is unique to McGregor and can easily put down for 10-20 years. KING FERRY WINERY MAKER OF TRELEAVEN WINES – Sure, the name is a mouthful. Go by Treleaven and you’re pretty covered. Ironically while Treleaven’s chardonnays have been praised with numerous awards, they weren’t my favorite. Although, I should disclose I’m not really an fan of traditional buttery chards. I fell in love with Treleaven’s Reislings in all forms and ended up a a bottle of each the Dry, Semi Dry and Late Harvest dessert wine. Bonus for NYC dwellers: Treleaven is a frequent visitor to the a number of Greenmarkets! BELLWETHER CIDERY – I have pretty high standards when it comes to hard cider. In my book, Doc’s from the Warwick Valley Winery & Distillery is the only one worth drinking. That is until we stopped at Bellwether. They have nearly a dozen types of cider ranging from bone dry to pretty sweet. I especially loved being able to pick out the apple varieties as they were used in different ciders as they transformed from dry to sweet. Their Original is simple and an easy crowd pleaser, but if you’re looking for more adventure on the dryer side, I recommend a bottle of Legacy. ITHACA BEER COMPANY – If you live anywhere in the Northeast region, you probably already know the Ithaca Brewing Company and their pretty spectacular beers. What you might not know is that they opened up a new Taproom last Fall. Quite a step up from the tiny tasting shack we visited last time we were here. Ithaca’s menu is pretty seasonal and everything we had was fantastic, so you can’t really go wrong. Opt for a pint of Nut Brown to get you started while you browse the menu of elevated pub grub and be sure to end your meal with the McKenzie Bourbon infused bread pudding, if it’s still on the menu. Next postMarch Foodie Penpal Reveal! Glad you had a chance to get back to the Finger Lakes! I’ve heard such great things about wines in the Finger Lakes. Loved this post! Going this summer, will consider these in my journies! The summer is beautiful! A little more crowded–I was there Memorial Day/Cornell Graduation weekend once. But if you’re an outdoorsy person, check out hiking or even walks along the lakes too. Have fun! We moved to Ithaca five years ago from NYC, love this area! I’ve had a long love affair with wine, but working at a local vineyard has turned it into an obsession. So much fun getting my hands dirty! Great read! I’m jealous! I’d love to work for a winery, or a farm, or any local food institute, but I can’t give up city living. Not sure what I would do without the subway a block away or if I had to own a car again.